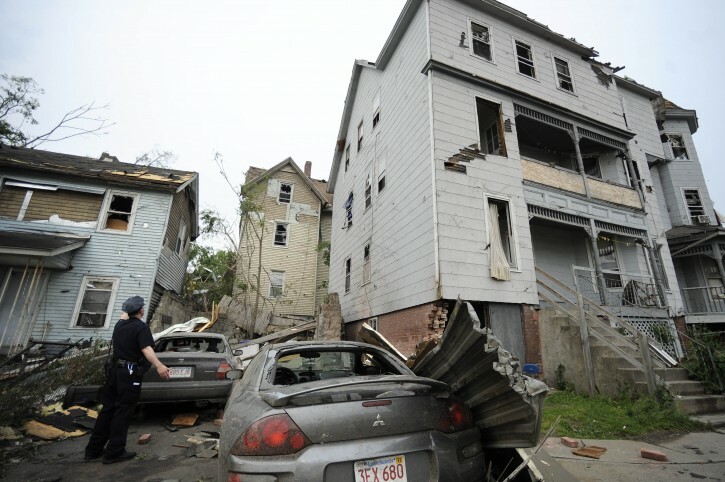 Springfield, MA - Injuries Reported After Apparent Tornado Hits Mass. 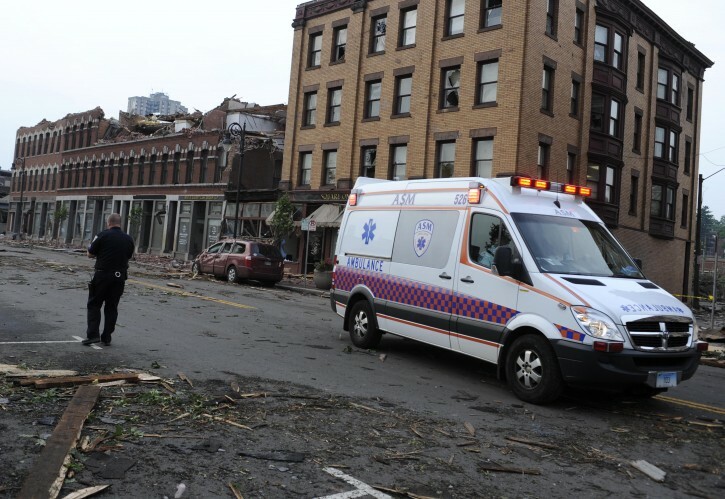 Springfield, MA - An apparent tornado struck the downtown of one of the state’s largest cities on Wednesday afternoon, scattering debris, toppling trees and frightening workers and residents. Several injuries were reported. Baystate Medical Center in Springfield, about 90 miles west of Boston, was treating numerous injured people, some with serious force trauma injuries, spokeswoman Jane Albert said. 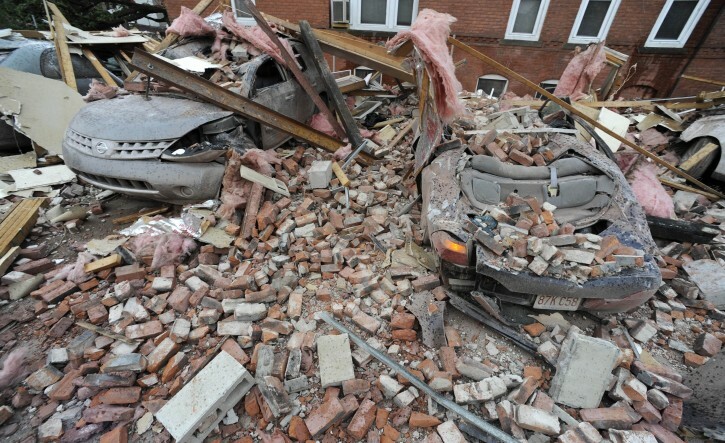 Television news footage showed buildings with their top floors pulverized or sheared off. Video aired by WWLP-TV showed a debris-filled funnel roaring into downtown from the west, crossing the Connecticut River and tossing water and debris. A spokesman for Mayor Domenic Sarno told The Associated Press there were no reports of any deaths and the city had requested help from the National Guard. Spokesman Thomas Walsh said he was looking out his City Hall window around 4:30 p.m. when he saw the funnel. “I could see this massive cloud of debris floating around in a circular, cylindrical fashion,” he said. After the winds passed, Walsh said, he could see about 10 large trees damaged in a square in downtown Springfield, the state’s third-largest city, with more than 150,000 residents. Officials also heard reports of damage in the city’s South End section, and emergency vehicles were heading there. The storm hit as workers were beginning to leave for the evening commute home. A tractor-trailer overturned during the storm on the Memorial Bridge leading to West Springfield. Walsh said city officials rushed to the basement when the danger became apparent. Damage at the city’s Cathedral High School included some blown-out windows, said Mark Dupont, a spokesman for the Roman Catholic Archdiocese of Springfield. All the students were safe, he said. The storm hit Springfield after a tornado watch was issued for much of the East Coast, including Philadelphia, New York and Boston. 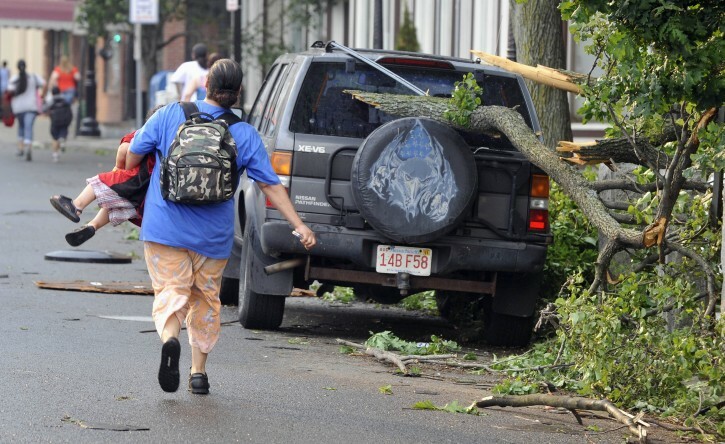 Massachusetts state police got numerous reports of tornado sightings Wednesday, including in Springfield, Monson and Wilbraham. Troopers were assisting with the tornado response. Police said there was heavy damage in spots and troopers were prepared to do house-to-house searches if needed. At the bar, Pashko said, the owner told people to get away from the window as patrons saw the storm on TV. “To see it live on TV when I’m five football fields away is better than being outside,” Pashko said. National Grid reported on its website more than 22,000 power outages, the vast majority in Hamden County, where Springfield is located. Western Massachusetts Electric also reported more than 12,000 outages in Western Massachusetts. Connecticut Light and Power spokesman Mitch Gross said around 50 workers were being sent to help out their sister company Western Massachusetts Electric with power outages.